Adam is our Project Engineer at Centaur. His role includes scheduling and quality control management, both of which are vital to a construction project. Adam’s everyday tasks consist of managing time and resources by creating timetables to determine phases of responsibility and when specific materials are needed. He assists the site superintendent in the field on matters relating to subcontractor task completion, deliveries, punch lists, quality control and an overall outlook of construction progress. 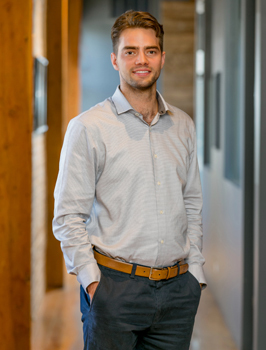 Adam boasts a Bachelor of Science in Construction Management and a Bachelor of Science in Architectural Engineering from the University of Cincinnati. When he is not making sure everything is “on time” and “in order” he enjoys traveling and exploring new countries. Adam also likes professional sports and is a loyal fan to any Cleveland, Ohio team as he grew up only a few miles south of the city. Chicago has provided him the opportunity to attend many art and music festivals and discover new restaurants and bars in various neighborhoods. A passion of his is furniture making, where the objective is to use recycled materials that normally would be tossed in the trash. The challenge of turning what most would consider useless items into a usable and aesthetically pleasing piece of work is what keeps him driven, along with challenging himself to complete the project at little to no expense.